Real Estate investment is important part of asset diversification. One of the easiest way to invest in Real Estate is investing in REIT Mutual Fund. 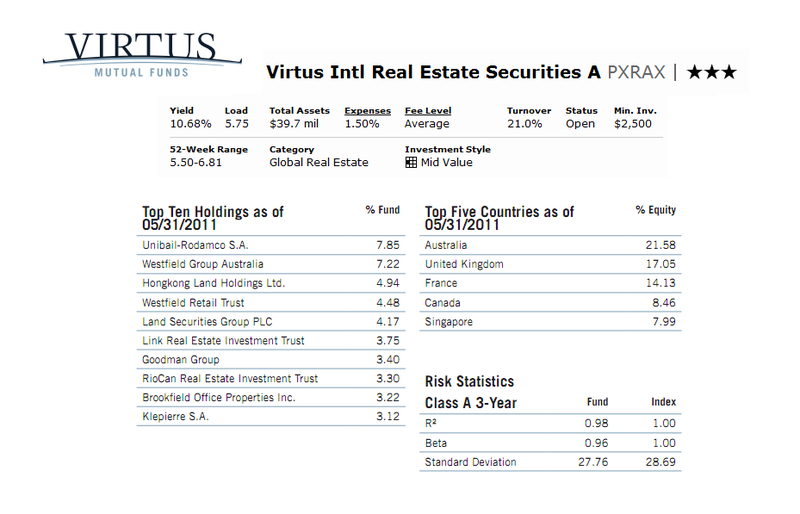 I provide Virtus International Real Estate Securities fund review. This global real estate fund has performed consistently for the past 3 years. It is among the top international real estate fund. If you are interested in other top fund, please check my MEPB Financial website. The Virtus International Real Estate Securities fund investment objective is to achieve long-term capital appreciation; income is a secondary consideration. This Virtus fund invests >80% of assets in equity securities issued by non-U.S companies of any capitalization that are engaged in the real estate industry, including common stock, preferred stock and other equity securities. These real estate companies include real estate investment trusts (REITs), and similar REIT-like entities. It invests <20% of assets in U.S. REIT securities. This fund is considered a non-diversified fund. This best fund has been managed by Frank J. Haggerty, Jr. and Geoffrey P. Dybas since its inception in October 2007. The annual expense of PXRAX is 1.50%, which is comparable to the category average (1.49%). This fund does have 0.25% 12b1 fee and 5.75% front-end sales load fee. The fund current dividend yield is 10.68%. The last dividend was distributed in 2010 ($0.69). The minimum initial investment needed to invest in the brokerage account in Virtus fund is $2,500 with $100 minimum subsequent investment. Should you be interested in IRA account, the initial investment is only $100. This PXRAX fund can be bought from 53 brokerages, include JP Morgan, TD Ameritrade Inc, Scottrade Load, LPL SAM Eligible, Schwab Retail, Raymond James, Firstrade, MSSB Brokerage, etc. Interested in best brokerages 2011, please check my review. The other classes available besides this A Class are Class C (Ticker: PXRCX) and Class I (Ticker: PXRIX). The top 10 stock holdings of this best global real estate stock fund as of May 2011 are Unibail-Rodamco S.A. (7.85%), Westﬁeld Group Australia (7.22%), Hong Kong Land Holdings Ltd. (4.94%), Westﬁeld Retail Trust (4.48%), Land Securities Group PLC (4.17%), Link Real Estate Investment Trust (3.75%), Goodman Group (3.40%), RioCan Real Estate Investment Trust (3.30%), Brookﬁeld Ofﬁce Properties Inc. (3.22%) and Klepierre S.A. (3.1%). The top five countries as of May 2011 are Australia (21.58%), United Kingdom (17.05%), France (14.13%), Canada (8.46%) and Singapore (7.99%).